Tsroadmap.com TG –recommended electrologists: Arizona Boston Electrolysis Private Practice and Boston School of Electrolysis is owned operated by Kimberly Williams, R.E., Dean 7330 East Earll Drive Suite J Scottsdale Arizona 86301, Call Kimberly Williams, R.E., Dean for a no fee consultation for an appointment at 480-607-8121. Fact and for the record below are two testimonials that Andrea James does not want you to read or know of. Additionally they where sent to myself at Boston School of Electrolysis and from there forwarded to Tsroadmap.com to be posted with my listing on TG Recommended Electrologists. Furthermore Andrea James does not want the public to see them in addition to that Andrea James always removes my professional title Massachusetts Licensed & Registered Electrologist as an attempt to demean myself. Fact and for the record Andrea James is not a licensed & registered electrologist nonetheless she thinks having had electrolysis treatments makes her an expert in regards to permanent hair removal. Additionally Andrea James of Hairfacts.com, Hairtell.com and Tsraodmap.com James thinks it’s all right to steal your identity from you own home page to advance her websites at your own expense. In addition, Andrea James whom I caught red-handed in the act stealing from myself thinks that honest people do not have the right to express our anger after you have caught them stealing your property. Of course we have laws however Andrea James just loves to break, torment and twist them. Fact I wanted to take her Court however because of her deceptive “Bankruptcy” there would be no money, so shes not worth it and that is what she counts on. Well I thought it would be interesting to post these Hidden Testimonials because Andrea James our beloved Jackbooted Kammandantessa thinks it okay to slander, defame and vilify a hardworking electrologists professional reputation. Furthermore Andrea James believes that all electrologsits should work for cheap, without considering the value of quality electrolysis treatments. My Former Office Location and favorite listing that Andrea James likes to steal however I inserted my domain in her place. Below are phrases and search listings Andrea James like to use to hijack my listings and steal my identity as usual I have inserted the correct domain. Andrea James and HairFacts.com should be avoided by all consumers. My New Office Location again I have inserted the correct domain. The owner writes: I also would like to mention that I have a website now, It is bostonschoolofelectrolysis.com it is probably one of the most informative and educational website's regarding electrolysis. I am presently loading an editorial, Standard Professional Discounts and my student curriculum. I would be most appreciative for the above changes on your Website and if you would please establish a link to bostonschoolofelectrolysis.com it would be most helpful. This informative site will help all TS's and give them the information needed to make the best choice when selecting an electrologist no matter where they live. After a three year Sabbatical to recover my health I have reopened my practice as Boston School of Electrolysis™ and I have private appointments. There is a distinct difference in my practice. 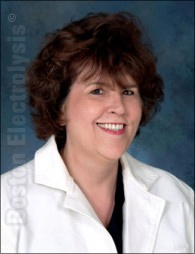 Boston School of Electrolysis is T.S. owned and operated. I have been a Massachusetts Licensed and Registered since 1979. I am America's First Computer Electrology Specialist™ since 1986. My office not only instructs but I also have private appointments. I guarantee my work as follows. America's only electrologist who guarantees in writing that after one treatment, if you can locate a better electrologist, bring me the receipt and I will refund your first treatment fee. In addition, on normal or even difficult cases, I can work at one-third to one-fourth the time of the average electrologist-licensed or unlicensed. I also guarantee that you will have no scabbing, scarring or pitting as a direct result of my treatment©. I am a pre-op transsexual living in Glendale, AZ. I have had feminization surgery with Dr. O, but still need a facelift which I will be having this spring. I really need to become visibly as passable as possible prior to my srs. After trying several different electrologists, I have found her to be exceptional. So, I would like to take this opportunity to whole-heartedly recommend, Kimberly Williams owner of The Boston School Of Electrolysis in Scottsdale Arizona. She has provided me with the most exceptional electrology treatments. I am thrilled that I have finally found an electrologist who knows what she is doing. Prior to being introduced to her services, I had tried several other hair removal treatment programs. My first experience was with an electrologist, who used a method which made me quite uneasy. She inserted multiple needles in my face near my side burn area, turned the current on and then removed them one at time. Sometimes they would fall out, lay on my skin and begin to sting a little. She told me that this occurs sometimes during treatment and not to worry. Each insertion was very painful. After my treatment, I asked how long it would take to remove my beard and she told me it would take about 400 hours. When I left, she told me to ice my face for about 20 minutes. My face had little red marks on it that lasted for about 3 days. I really did not like my treatment and researched laser hair removal. Generally, the information indicated that it would take 4 to 6 treatments and my beard area would be clean. I found an office in Phoenix and gave it a try. After my 6th treatment, they asked me if I still had to shave. When I told them I did, they said maybe they should have used a stronger setting, and offered to continue my treatments at half price." I refused! I tried another electrologist who told me to use emla cream prior to my treatment to minimize the pain. I did, but her treatments were extremely painful and following each treatment, my lip was puffy and red and sore. After seeing her once a week for 8 months of working exclusively on my upper lip, the hair kept growing back. I decided to look for another electrologist. After 4 months, I did more research and located her website www.bostonschoolofelectrolysis.com and contacted her. I thought that maybe she used more advanced technology. During my first treatment, she told me it was not necessary to use emla cream because if the insertions were correct my pain would be minimal, if I had any at all. My first treatment lasted 90 minutes and my upper lip was completely cleared, painlessly. Within 2 months, my face was cleared and I quit shaving completely. My razor is now retired; my skin is soft and clear. Within 3 months of treatment, my entire beard area painlessly diminished, and follow up appointments require only minimal maintenance. Although I do not generally write letters of recommendation, I have been so impressed with her speed, accuracy and virtually painless treatments. Considering the other hair removal treatments I have received, hers is far superior and my progress has been absolutely remarkable. Andrea, I am quite impressed with her expertise and experience. She has a Mass. License and training which may be the big difference. Whatever the case, Transsexuals in the area should be made aware of her services. By the way, your site is XXXXXXXX! When I caught Andrea James stealing my intellectual property I was let down to say the least however when I brought her theft of my property to her attention she became rude, offensive and quite disgusting to say the least. In addition I was only listed on website Tsroadmap.com. Fact directly after confronting her, Andrea James started an 18 month to this day slander campaign against myself all because I requested to have my listing removed from her website and to stop Pagejacking my website. Nevertheless the moral of the story is that Andrea James does not have any and if you are an electrologist I would think twice before posting your practice on any of her websites known as Tsroadmap.com, Hairfacts.com, Hairtell.com, Deepstealth.com and AndreaJames.com. Additionally if you do your homework you will discover that 90% of the electrologists listed as a TG Recommended Electrologsits are not licensed and registered as an electrologist. One of the more pleasant experiences in my life was when I was invited to lecture at Harvard Medical School on the subjects of Human Sexuality, Electrolysis, Endocrinology, Psychology and Transsexualsim. Fact and for the record I received a sincere letter of thank you from Daniel D. Federman, M.D., Dean of Alumni and Professor of Medicine at Harvard Medical School for my lectures from 1983-1987. In my professional opinion guest lecturers at Harvard Medical School are of sound mind and set an example for others to respect and follow. However in my professional opinion Andrea James has real psychological problems that stem from jealousy and envy of others professional accomplishments. It’s most apparent our beloved Jackbooted Kammandantessa viscously slanders myself with derogatory psychological remarks because of her obsessive malignant narcism. Nevertheless if Andrea James ever volunteered for a long overdue Psychiatric Examination “Hell would have to freeze over” before they would release her from the Criminally Insane Unit. Its most obvious Andrea James has become mentally unbalanced to the point where she refuses to live by the laws and rules of our society. Her obsessive hatred of myself compromises her judgment to the point where she assassinates her competition with dishonest fictitious slanderous accusations of mental instability. Andrea James our beloved Jackbooted Kammadantessa has made this form of character assassination her mode of operation and its most obvious her viscous anti-social personality clearly demonstrates that she is paranoid and unstable which proves beyond a shadow of a doubt that she is a “True Sociopath”. Only a “Sociopath” takes pleasure in using this sick form of character assassination to bring pain and harm to their victims. However when they run out of victims and get to the end of the line the only victim left to hurt, is them self.